Since the Renaissance, at least, the medium of sculpture has been associated explicitly with the sense of touch. Sculptors, philosophers and art historians have all linked the two, often in strikingly different ways. In spite of this long running interest in touch and tactility, it is vision and visuality which have tended to dominate art historical research in recent decades. 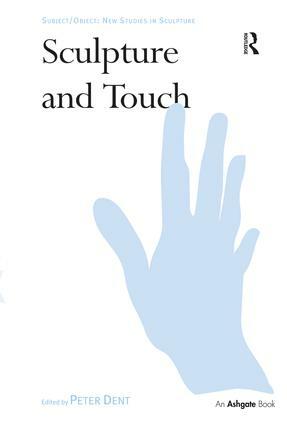 This book introduces a new impetus to the discussion of the relationship between touch and sculpture by setting up a dialogue between art historians and individuals with fresh insights who are working in disciplines beyond art history. The collection brings together a rich and diverse set of approaches, with essays tackling subjects from prehistoric figurines to the work of contemporary artists, from pre-modern ideas about the physiology of touch to tactile interaction in the museum environment, and from the phenomenology of touch in recent philosophy to the experimental findings of scientific study. It is the first volume on this subject to take such a broad approach and, as such, seeks to set the agenda for future research and collaboration in this area. Contents: Introduction, Peter Dent. Part I Origins: Touch and the cheirotic apprehension of prehistoric figurines, Doug Bailey; Touching sculpture, Hagi Kenaan; Bringing into being: vivifying sculpture through touch, Michael Paraskos; Pictorial essay A: out of sight, Claude Heath. Part II Approaches: To touch: Herder and sculpture, Andrew Benjamin; A taxonomy of touch: tactile encounters in Renaissance Italy, Geraldine A. Johnson; The neglected power of touch: what the cognitive neurosciences can tell us about the importance of touch in artistic communication, Alberto Gallace and Charles Spence; When touch shatters meaning: the case of sculptures made for sight only, Francesca Bacci; Pictorial essay B: playing with fire, Rosalyn Driscoll. Part III Identities: Beyond the touch tour, Julia Cassim; The sculptor is a blind man: Constantin Brancusi’s Sculpture for the Blind, Sebastiano Barassi; Embracing stone, holding brushes: differentiating touch in the Unit One photographs, Fiona Candlin; Lorenzo Ghiberti and Michelangelo in search of the feeling hand, James Hall; Pictorial essay C: the touch of the oracle, Michael Petry. Select bibliography; Index. Peter Dent is lecturer in History of Art at the University of Bristol, UK. We have become familiar with the notion that sculpture has moved into the 'expanded field', but this field has remained remarkably faithful to defining sculpture on its own terms. Sculpture can be distinct, but it is rarely autonomous. For too long studied apart, within a monographic or survey format, sculpture demands to be reintegrated with the other histories of which it is a part. In the interests of representing recent moves in this direction, this series provides a forum for the publication and stimulation of new research examining sculpture's relationship with the world around it, with other disciplines and with other material contexts. The Henry Moore Institute, a centre for the study of sculpture, has developed this series. A part of the Henry Moore Foundation, the Institute is an international research hub located in the vibrant city of Leeds where Henry Moore began his training as a sculptor.